When I’m not running, blogging, working, sleeping, and putting off making peach ice cream till tomorrow night hoping the heavy cream I bought for said ice cream is not going to spoil by the time I get around to making it (fingers crossed! ), I love to craft. I am really good at crafts, considering I’ve had no formal training and I hate to follow directions. I am even better at procrastinating which is why I do a DIY post more seldom than I clean out my refrigerator. I don’t know what came over me… maybe it was the urge to procrastinate some other household task. Or maybe it was the fact that my sister’s baby shower was in about ten days, and even though I couldn’t be there, I wanted to sent a gift, and the pressure was on. This was no ordinary baby shower, where the mom-to-be opens the gifts. It was to be a “viewing” where everyone could see the purposely unwrapped gifts, so I wanted mine to be special. (Shhh don’t tell, I have another special gift that actually costs money in the works for her, but that will come later. All I’m going to say is it’s the best gift every new mom never knew she needed). So I knocked this baby out in just two sittings. I started Round One right when Sweet Pea went to sleep one evening and worked for about two hours. A couple of days later, I banged the rest out during nap time, in about an hour. Actually, I’ve learned a lot since making my first mobile, which I made for Sweet Pea, and if I could impart just one tip, it would be this: Don’t expect to work on a DIY mobile for more than 15 minutes at a time if you are making it anywhere from one to three months postpartum. The only DIY project you need to be worried about at that point is feeding another human from your own body if you are breastfeeding. So this mobile was quick, free, easy, and I think it turned out great. Fabric (velvet works well because it is stiffer than calico). 1. 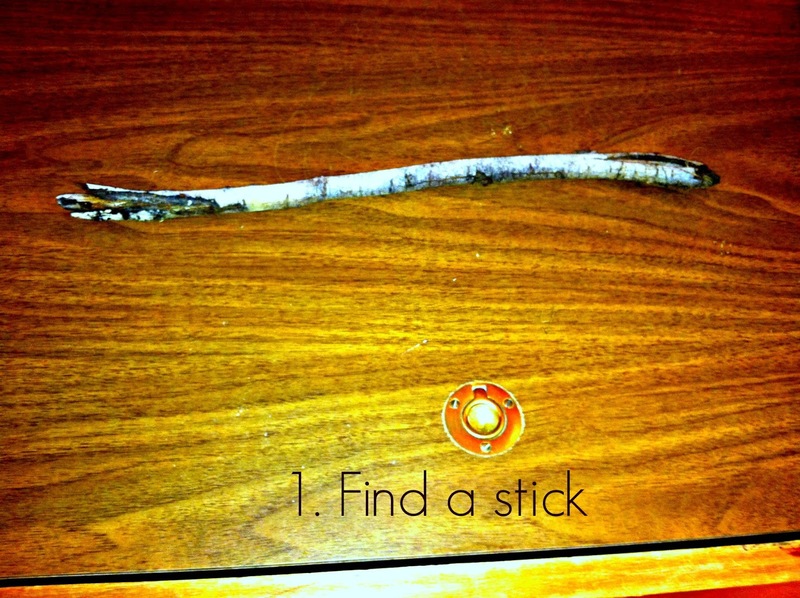 Find a stick. I found a stick in my backyard. This looks way more interesting than it did in real life. Bear with me, I am experimenting with PicMonkey. 2. Select Fabric. I found this fabric in my fabric dresser. What, you don’t have a dresser full of fabrics you bought with the best of intentions, never used, and then found yourself requiring a whole new piece of furniture to house your forgotten dreams? I think I meant to use it to make a purse ca. 2003 but that never happened. (See procrastination, above). 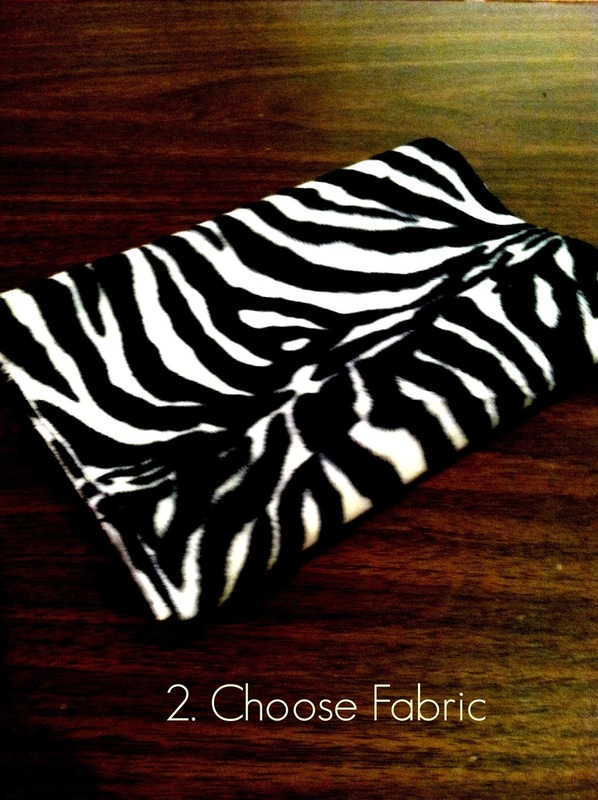 I waited so long to use it that zebra print fell out of style (if it ever was in. At least I thought it was). My sister specifically requested a black and white mobile so this was perfect. Added bonus- the velvet fabric made this material a bit heavier than regular material, so it was easier to manipulate when cutting and gluing. 3. 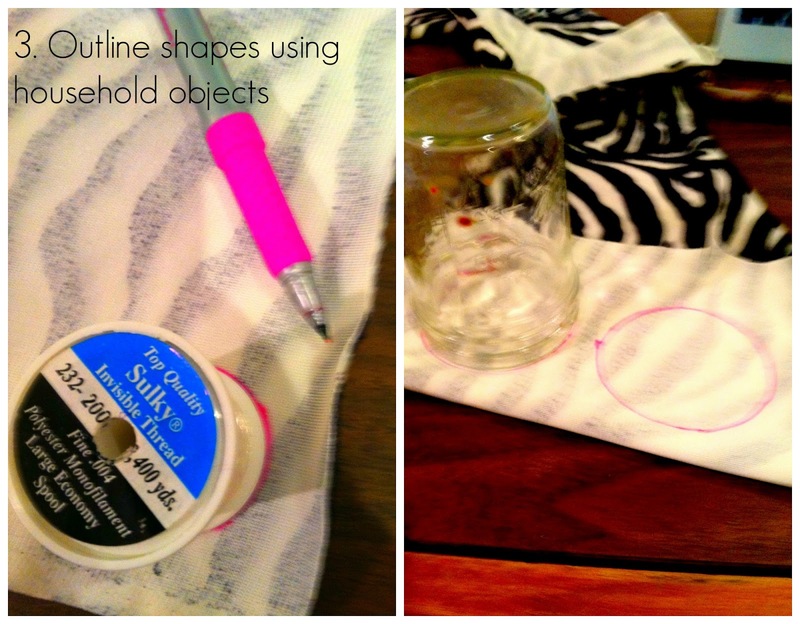 Outline shapes on your fabric by tracing household items. I apologize. My thread looks huge compared to the mason jar. But I used the thread spool for my small circles, the little mason jar pictured for the medium circles, and the base of a Sig bottle for the big circles. I folded my fabric in half when I cut out my circles so to save time, and to ensure an even number of identically sized circles. This is important because you will glue them together with the insides facing in, pretty sides facing out. Note: I chose circles. You could do any shape you want. Stars would also be fun, but I think tedious. 4. 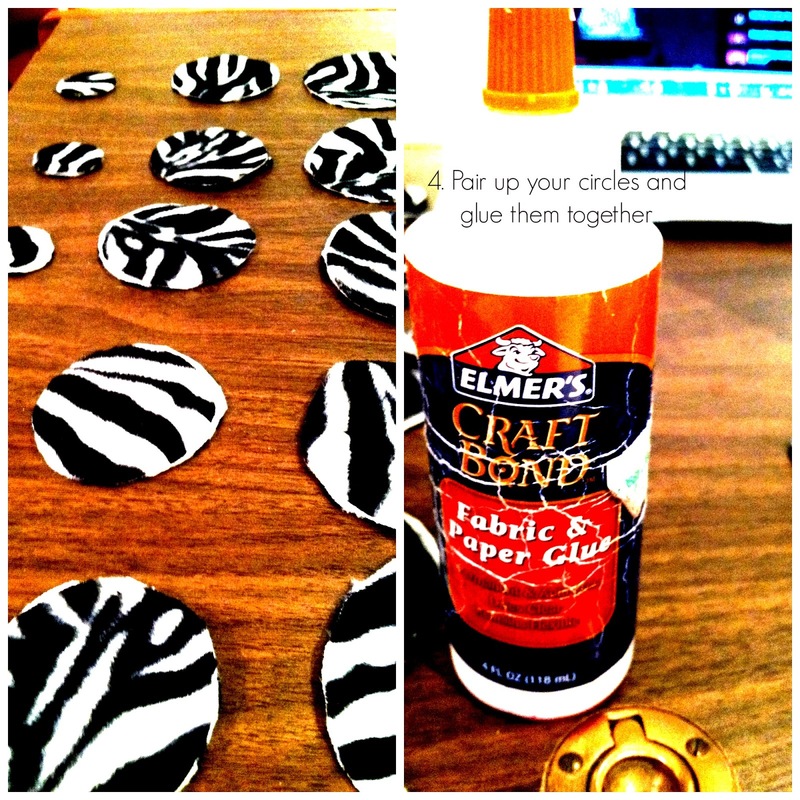 Arrange your identically sized circles with the right sides out, wrong sides facing in and glue them together. Elmer’s Craft Bond glue worked nicely. Once I glued them together, I used my awesome fabric scissors to cut each circle pair together to make sure there were no non-matching edges. Notice, the laptop in the background is featuring the Listen To Your Mother You Tube Channel. I watched the entire Madison most of the Chicago 2013 shows during this project. I have nothing else to say about this because I wasted so much time trying to get that image right on PicMonkey. That’s why the text looks awful. Like I said, I am still learning PicMonkey. 5. 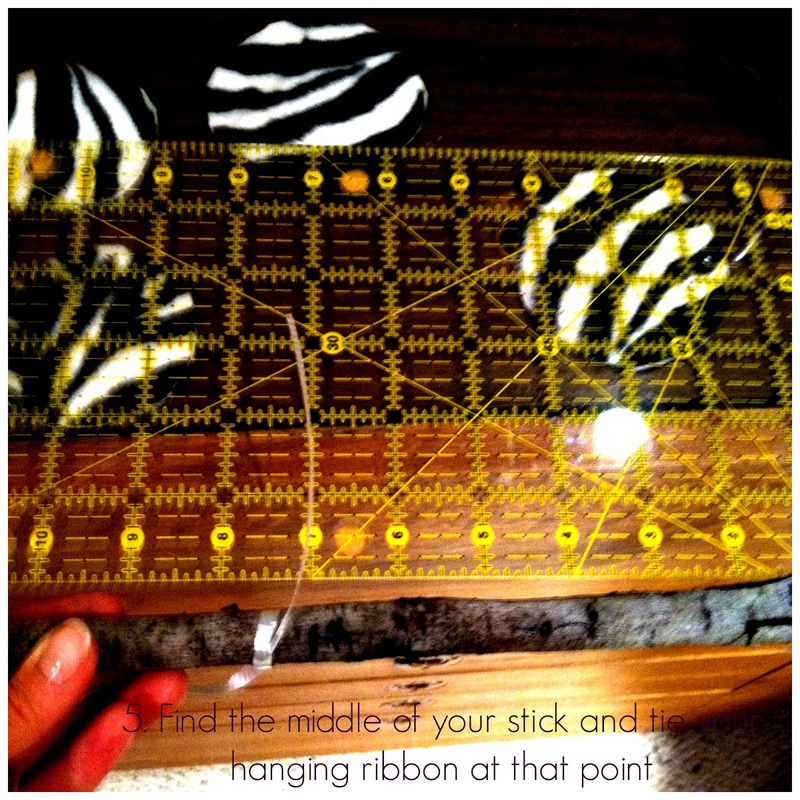 Attach a long ribbon to the middle of your stick. Next I measured the stick and placed the ribbon from which the mobile would hang from the ceiling right in the center, so that it would hang evenly. There are a million ways to attach it, but what I used was a simple square knot. I left more ribbon than my sister would ever possibly need at the end, as she can always shorten it to meet her needs, but it’s impossible to make it longer without re-doing it. I used white gift wrapping ribbon, which I already had. 6 . Cut and tie all of your ribbons to the stick. Now cut pieces of the ribbon whatever length you want and attach them to your stick. 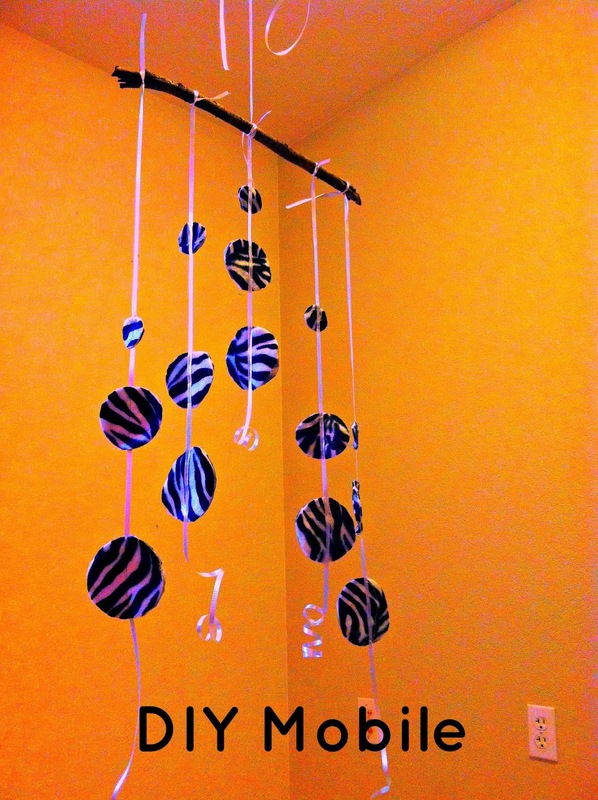 I took care to space my five ribbons evenly, to ensure the mobile will hang straight. Again, I used a square knot. I cut each piece much longer than necessary, than trimmed them to the lengths I wanted once they were tied to the stick, since I wasn’t sure how much length of the ribbon I would use up when tying them to the stick. P.S. PicMonkey is awesome and free, but I am so over it right now. You have no idea how long it takes to make my mediocre iphone photos into pretty PicMonkey photos. 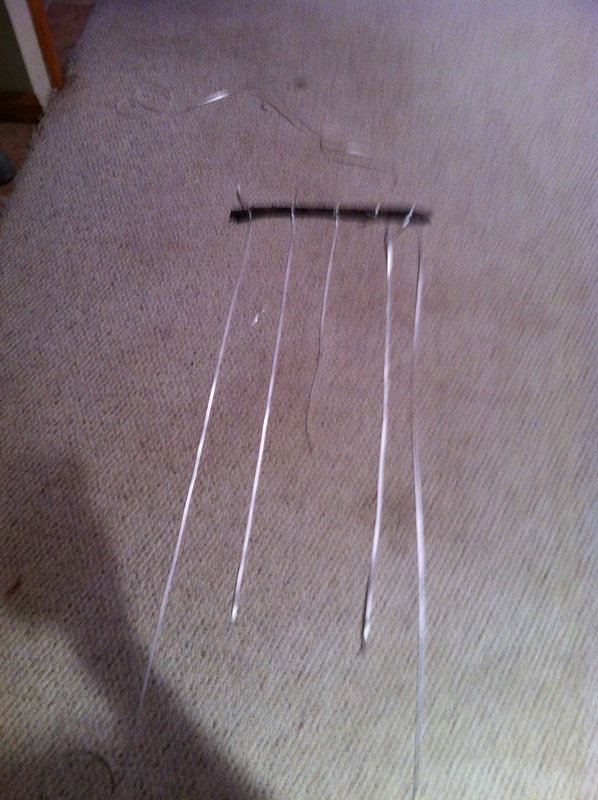 And this is important- It really helps to attach the ribbons first and then attach your pieces to the ribbons. Otherwise, the ribbons much harder to manipulate, and they can easily tangle with each other while you are trying to attach them to the stick. I made this mistake with my first mobile. Also, I did my first mobile with invisible thread instead of ribbon and I used an embroidery ring instead of a stick, and as you can see I am using neither of those materials again. And… voila! A beautiful mobile that’s even more beautiful once you PicMonkey the crap out of it. When it was all done, I got kind of excited and curled the ribbons at the bottom, like you would on a gift. Maybe it was over the top. I don’t know, it seemed like a good idea at the time. If I were to do this again, I would try felted wool. You wouldn’t have to glue the right sides out because it’s the same on both sides. I think it would be cool to do concentric circles in different colors with felted wool. 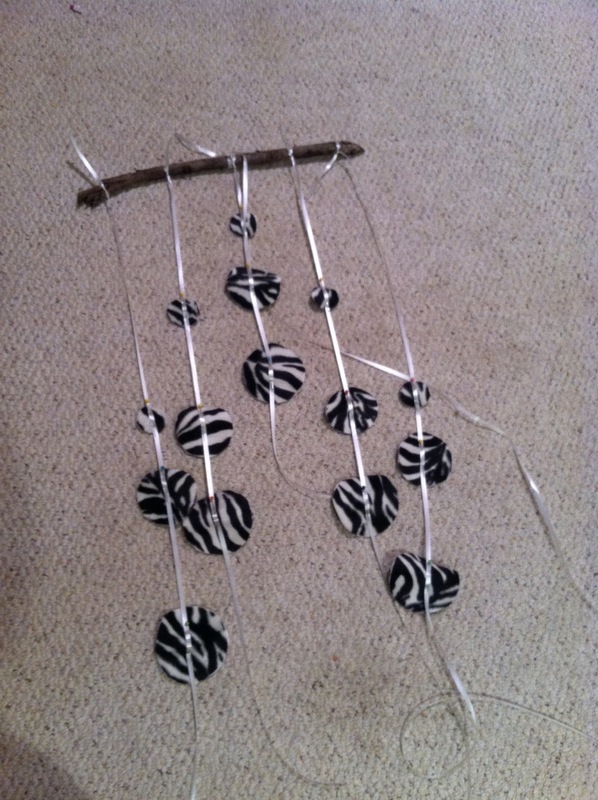 Have you ever made a mobile? What materials did you use? How did you like the finished product? Wow what a great site, glad I saw this it was so helpful. Being a mother of 3 and I enjoy fixing and making things for my babies Have you read about http://www.babycribmobilekit.com, another great website!